Featured at the Aim Higher Foundation’s Night of Light celebration, the video “Isaac’s Blessing Bags” is a look at one of the more than 1,300 Aim Higher Scholars and his impact on the local community. The Foundation made this video about Isaac for the event. For its Advent 2017 service project, Community of Saints helped those in need, thanks to the amazing idea of then-sixth-grader Isaac Garcia. Students collected items to create “Blessing Bags” that were distributed to people who were homeless and/or in need. An article about the project called “Isaac’s Wish” appeared in The Good News Spring 2018. Isaac Garcia was a speaker at the Aim Higher annual fundraising event. 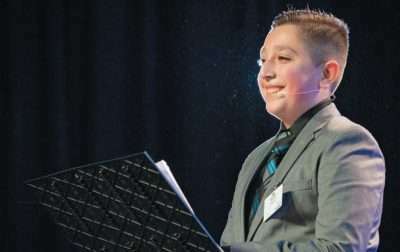 COS seventh grade student, Isaac Garcia, was the Aim Higher Scholar featured at the 6th annual Night of Light. The Aim Higher Foundation was established in 2011 to provide tuition-assistance scholarships to students seeking to attend Catholic schools throughout the Archdiocese. The Night of Light is the organization’s primary annual fundraising event. Every year, the Night of Light highlights schools and students from the 83 Catholic schools in the Archdiocese. Isaac was chosen in recognition for his volunteer work on behalf of the homeless people in his neighborhood. 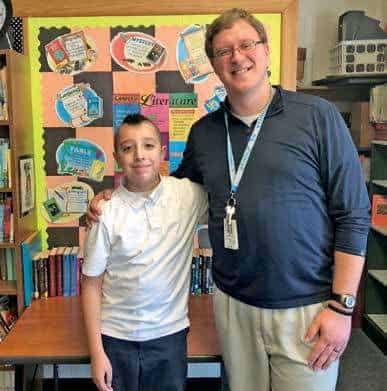 Isaac’s story was featured in the Spring 2018 issue of The Good News. The Aim Higher Foundation seeks to ensure that all children can access the life-changing benefits of a Catholic education. Since 2012, the Foundation has provided tuition assistance scholarships to more than 6,600 children—worth more than $5.1 million—to attend Catholic schools in the Archdiocese of Saint Paul and Minneapolis. See article “COS Student Featured at Aim Higher Gala” in The-Good-News-Fall-Winter-2018. Isaac Garcia with Community of Saints teacher, John Capistrant. In December of 2017, COS 8th grade student Jose Garcia helped his younger brother, Isaac, every step of the way with the “Blessing Bags” project..